This is one of my son's favourite (he likes anything with pasta) which we had about a week ago. I finally persuaded him to do it by himself. I armed him only with the recipe and all the ingredients. And he did it ! Well done! Although as expected after he was finished our kitchen looked like a bombsite. Sauce splattered everywhere, bits of onion and garlic on the floor, pots and pans galore plus a mountain of things to wash in the sink. Haay naku, at least he's not as useless in the kitchen as his dad ;-). Okay on with the recipe, the key here is to keep the size of the meatballs small. Make it no bigger than a conker (about 3/4 to 1 inch in diameter). The bigger the meatball the tougher it tends to be. And it's easier to keep the ball's shape when it's small. I baked the meatballs to minimise oil but you can always pan fry it. Tear apart sliced bread. Soak in milk for about 30 minutes or until bread is completely soft. (You can also use an equivalent amount of breadcrumbs). Mash it with your fingers. Combine beaten eggs, salt, and pepper. Add in minced beef, parsley, softened bread, and parmesan cheese. Mix well. Form into balls of about 3/4 to 1 inch in diameter. (One technique in making the balls - put some meat mixture on your palm; make a fist and then let the meat come out between your forefinger and thumb). Put meatballs on a baking tray and bake in 350F for about 5 minutes or you can pan fry them until browned. Transfer to a bowl/plate and set aside. Saute the garlic and onion in a pot until onion is translucent. Add the chili flakes and saute for about 1 minute. Add the mixed herbs and saute for another minute. Pour in the chopped tomatoes, salt, and meatballs. Mix well. Bring to boil and simmer for 1 hour. Add water a little bit at a time if it is drying out too much or if you want more sauce. Put water in a big pot (enough for the pasta to swirl around - about 2/3 up the side of the pot). Add 1 tsp. salt. The salt is to keep the water from boiling over too much. Bring to boil then add the spaghetti. Start timing now. Follow the timings suggested on the pasta package. This is usually 11 minutes for regular spaghetti or tagliatelli and 9 minutes for the quick cooking ones. Stir pasta from time to time. Pour and drain cooked spaghetti into a colander (not plastic!). Briefly put under tap water; this is to remove excess starch - drain again. *Update* I don't put oil any more after draining since you want the sauce to cling to the pasta not slide off. 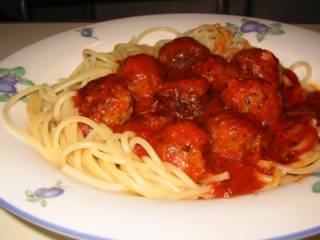 *Serve meatballs with sauce on top of spaghetti. Grate more parmesan cheese on top if desired. okay lang ang bombsite, ang problema ay ang fatal recipena nakakapagdiarrhea kahit sa pusa. Oo definitely, huwag yong makaka stomach bug. Thanks for dropping by, cath. ok, now you've made me crave for this. mapaluto nga kay jet with meatballs - matagal na kaming di kumakain ng spa-jeti. salamat bossing celia!!! ang dami mo na ngayong tagahanga - just today, i got an email from doc emer telling us about the great hardboil egg tip he got from you. naks naman. Thanks for dropping by Batjay. Glad it inspired you to cook. Nag-iingat nga ako sa pag mention ng meatballs baka kung anong balls ang masabi ko. Nyehehehe!